This rug has been handwoven in the finest cotton yarns by artisans in Rajasthan, India, using a traditional weaving technique which is native to this region. 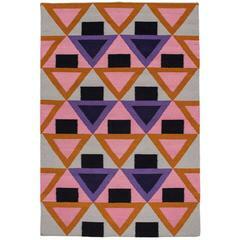 The purchase of this handcrafted rug helps to support the artisans and preserve their Craft. Size: 8' x 10' Care: We recommend spot cleaning with warm water and a mild detergent / professional rug cleaning.